I just opened up my curtains and I must say this week is not off to a good start weather-wise. The storm I could hear raging outside while I was in bed last night has calmed down but it’s still drizzeling and windy. After a summer of heatwaves I kind of forgot how to dress for this dreary weather. I think I’m going for ladylike today, with my new black rider boots and my trenchcoat. On rainy days like today I like to add a touch of sunshine to my outfits. Ideal pieces to do this are my fave statement ring I got at Dulles Airport and this bright ankle jeans from J.crew. These jeans are from the Toothpick collection they had this summer and are seriously the most comfortable jeans I’ve ever had. They feel like sweatpants, soft and stretchy, so eventhough they’re skinny they move with you like a second skin. I should have gotten a cobalt pair too! But wallets get empty fast when you’re in New York! I’m not very much awake yet, but I’m already in stress. Healthy, exciting stress. Today I’m finding out who will coach me while I’m writing my thesis and I’m meeting up with my internship to help me find a subject for said thesis. The thesis is the final, key piece to my education and it’s what I’ll be reading on and working around this whole last year in college. Pretty important and pretty exciting. I’m off to the bus station now and I’m SO hoping my fave coffee place is open. Today is a perfect day for a caffe latté with hazelnut sirup. I’m such a hipster. All I need more is a vintage umbrella to keep me dry. Oh wait, I have that. Previous Post Urbexing in dad’s tool shed. Because I’m cool and stuff! Love the outfit, as usually, I'd wear everything on the photo! Caffe latte with hazelnut sirup sounds oh-so-yummy (and my friends keep joking around that I'm a hipster because I have a blog, I love food and I have a vintage clutch. Haha. 😐 ). Anyway, good luck with the internship and the thesis! Hope you have a good time working on your thesis today! Haha, kzag nog niet dat je hier hebt staan: "I can understand English, Nederlands and Français!" YES, these pants are amazing! I love dressing bright on dreary days, it just makes me feel happier. Good luck figuring out my thesis…it sounds like an exciting time for you. Good luck finding out about the internship stuff and thesis coach! This is the perfect outfit to balance out a gray day! Those pants are fantastic, and they look great paired with those burgundy shoes. Good luck with your thesis meetings! These are so cute on you! i love them!! I love that your ring is from the airport. I need a pair of J Crew pants. I've been eyeing the pixie pant but haven't pulled out my wallet yet. Have a lovely day and good luck with your thesis! Love the combo of the yellow and burgandy shoes! Yay to a vintage umbrella! Good luck on finding the perfect mentor. Those skinnies are such a dream on you, and I love how you played up the colour with your ring! beautiful colors, love the green and gold! AWESOME look. Great way to bring some sunshine into the rainy day 🙂 and I love the colour of those shoes! hazelnut in anything is perfection – and i LOVE YOUR PANTS. What a gorgeous color on you! And I love the yellow pants with plum shoes! Gorgeous Fall color combination. sunshine pants is right! It's good to bring the sunshine pants around in fall. I'm going to be honest; oxblood scares me. But your shoes? The perfect touch. Happened upon your blog and love it! Those yellow pants are amazing as is the ring. I love that you paired the brights with the polka dots and the maroon heels. Super cute! I love the mustard pants paired with the burgundy heels, so chic! 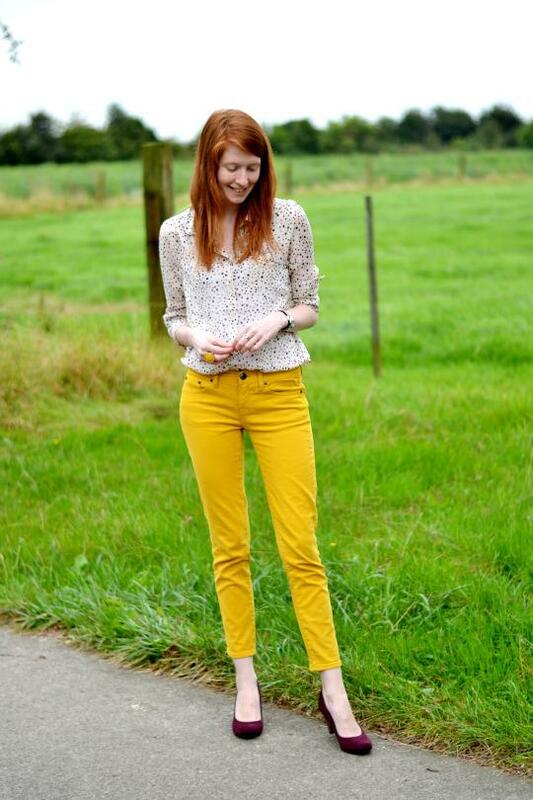 I am loving your mustard colored pants, I've been thinking of getting a pair myself! And that ring… that ring is gorgeous! I love your bright yellow pants! I like to wear bright colors when it's rainy too. It just makes the day seem happier! I really love your matching yellow ring too. Such a cute casual outfit. both your pants and your shoes look so great! Ik merk echt dat gele broeken gigantisch hip gaan worden dit najaar! In de winkel waar ik werk verkopen ze namelijk echt super goed :p … Hij staat je alleszins super mooi en die ring is ook super pretty! Wauw, dat geel staat je goed! En die kleur van je schoenen vind ik zo mooi! wowness Nikki! do your yellow pants ever pop against that glorious green grass!! LOVE this so much together. Nikkiiiii =D Die broek is zooo nice *w* Ik vind die kleur echt super voor een broek en die ring past er echt super goed bij. Love those pants and the shoes are perfection! !